This cart looks great and was fairly easy to assemble, but it's not super sturdy - I don't recommend moving it much. Dimensions 18.0 In. X 33.0 In. X 37.0 In. So, we LOVE the style, but the instructions should really tell you that once you've put together most of it - that last leg will seem like it is off center of the holes. Loosen up the other side just a hair and it will come together. My goodness this piece is SO perfectly mid century darling - it fits right into our living room and we live in a small apartment in NYC. Went ahead and fit a person in there to give you an idea of the size! Get This Piece. 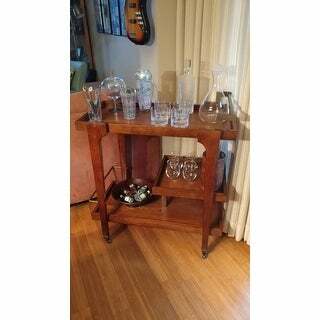 I love this bar cart! It was relatively easy to put together. Just time consuming. Took me about an hour. Lots of bolts and pieces. The quality is better than expected with solid wood pieces. The wheels don't roll that great, but mine will sit in one spot for the most part. This was such a great addition to our front formal living area and my husband loves it as I bought it for him for our anniversary. This Midcentury modern bar cart is exactly what I was hoping for and more! 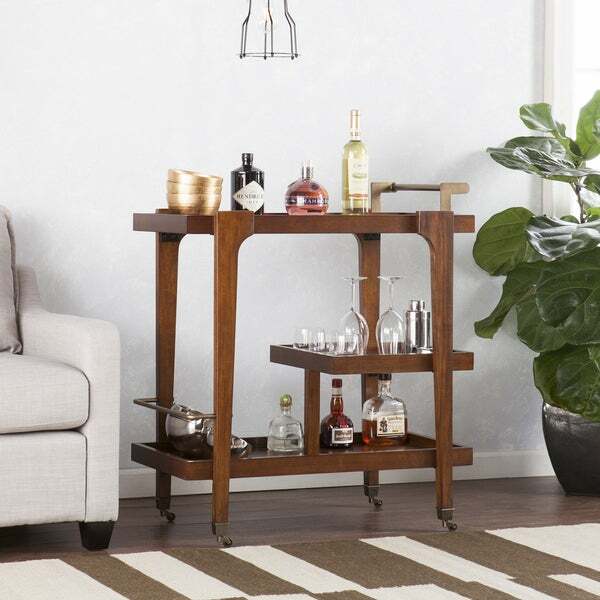 I spent a long time looking for a bar cart that was both stylish AND functional, and this one takes the cake. It has a mini third shelf that’s perfect for storing stemware that’s also easy to grab, and plenty of space on the top shelf or bottom to put all your bar tool essentials and liquor/wine on as well. It took about an hour to put together but was not difficult at all, and is made of sturdy material which is important to me. 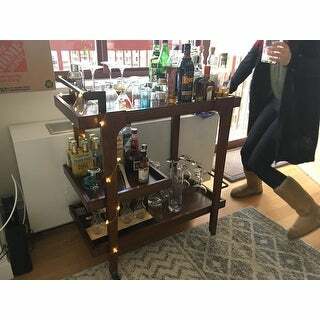 I love this bar cart and can’t wait to throw a party! More beautiful than I expected! Really nice quality wood. Very sleek design - I'm afraid it's stealing the attention in the living room! Looking forward to serving guests drinks from this cart! More labor intensive to build run expected. Not difficult, just plan on up to 30 minutes or more. Added a little wd40 to wheela when done and it glides quietly across the floor. 4 thumbs up! Excellent size for storing lots of glassware and bottles. The extra middle shelf is a really useful bonus. I deducted a star, but really more like half a star because the wheels are small which I thought looked a little funny and don't roll very well...they're just stiff but they do seem sturdy. My husband didn't mind the wheels at all and it stays stationary in the corner anyway. Worthwhile purchase and looks great with my midcentury style home! This table is so much bettet quality than I expected! It was not difficult to assemble and the quality is so great everything feels very sturdy! The instructions were a little undetailed but if you take your time you should have no issues. I am also pleasantly suprised at the size of this bar cart. 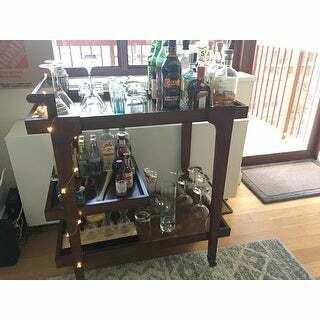 The height is just right and not too low which can be a problem with some bar carts. It is also much wider and deeper than I expected so it doesn't look over crowded even with quite a few bottles and cups on it! This was an unbelievable purchase, especially for the amazing price. Takes about an hour to unpack, fully assemble, and dispose of packing materials. It is a sturdy cart that will probably require WD40 on its metal wheels to roll properly. Happy so far with the purchase. This bar cart is very classic and chic. Overall, the directions to put it together were easy to follow. However, a couple of the guiding holes were very small and both my mother and I struggled to get the screws in by ourselves. My husband (who is stronger than both of us) ultimately succeeded in getting them in, and now that it is assembled the cart looks great. The wheels do squeak a bit, but it kind of adds to its old fashioned charm. I'm very happy with the cart. Love this! It’s an absolute beautiful piece. All the other reviews were on point. It looks more expensive than what it was. Very classy and I believe it could go with any decor/style. The assembly was fairly easy once you got the hang of it but since I did it by myself so it took longer and was harder to do. If I had a second person helping I think it would have been easier. Aside from being challenged with the assembly it was a great purchase! Really beautiful and quick to put together! Five stars. 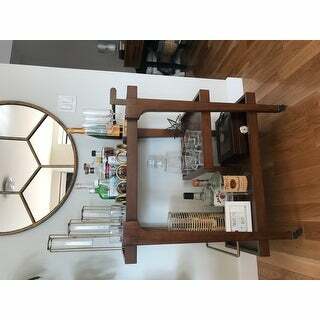 Love this bar cart! Simple assembly. Looks great and is solid. This added so much character to our living space in apartment. See for yourself in photo! This is a solid built cart and really nice looking. It's all real wood and feels very sturdy, along with the metal parts that have a rustic solid feel to them. Was relatively easy to put together! Nice and elegant cart. Very simple to put together. The hardware looks rusted and dark which I did not like. I was expecting for the hardware to be gold. I ended up painting it my self and it looks so much better! The wood color is very nice with the brass accents. It comes in SEVERAL pieces and needs to be assembled. I like a style and price of course. "Is it possible to replace the wheels for more functional wheels?" We do not recommend altering any of our products, as it negates the manufacturer’s warranty. "Are the wheels required? This bar cart is a little tall so we're wondering if we could spare an inch or two by removing the wheels." Unfortunately, the casters are attached to the legs at the factory and are not designed to be removed.